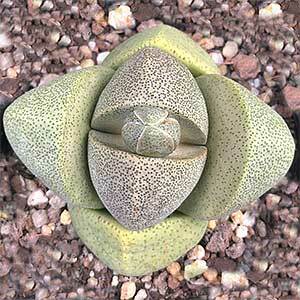 One succulent with a difference is Pleiospilos nelii, also known as the ‘Split Rock Succulent’ and is one of the Memsebs. It is a native of South Africa, and its natural environment is in desert areas, so sun loving and very little water. This makes titan ideal house plant, as long as it gets adequate sun. Pleiospilos nelii will flower, orange and yellow flowers will shoot from the centre of the plant, often more than one. The flowers open and close with the light, and if they are pollinated they will be followed by seed pods. Indoors, hand pollination will be needed. Watering is the key to growing this plant, you can usually get away with watering 3 – 4 times a year in spring and again in autumn. Watering should be by a deep watering, and at least 4 weeks apart. Between waterings, the soil needs to dry completely. One deep watering in water in winter and very little in summer. Watch the foliage, new leaves, a pair of them, should start appearing in winter. The old leaves should die as these provide the energy and moisture for the new pair. If the old leaves do not die back by summer, chances are you are overwatering, and this will kill the plant. Foliage – Marbled or spotted green. Mesembryanthemaceae, or Memsebs are a group of succulent plants. They range from small low growing plants to bushy shrubs. Of the over 1500 species it is the smaller growing plants such as Lithops, Pleiospilos and Conophytum that are popular with collectors. Carpobrotus including Carpobrotus edulis, Lampranthus and Drosanthemum species are more widely used in landscaping.